Trump thanks North Korean leader, following return of remains of US servicemen from Korean War to US soil. 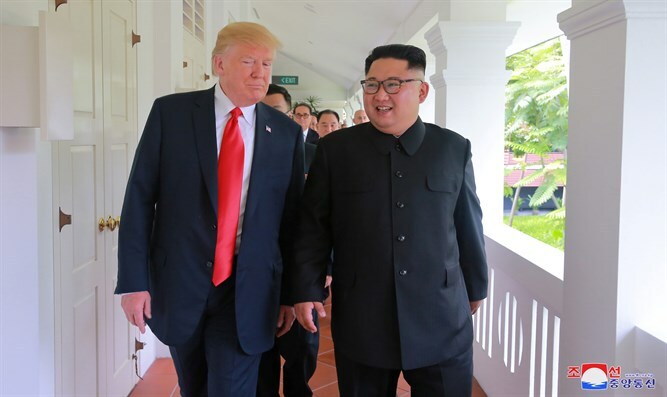 US President Donald Trump thanked North Korean leader Kim Jong Un Thursday morning for returning bodies of US servicemen killed in the Korean War. He also thanked Kim for a “nice letter” he received from the North Korean leader, though it was unclear if this referred to Kim's note to the president following their summit in Singapore thanking him for his “energetic and extraordinary efforts” to improve the once-hostile relations between the two countries. “Thank you to Chairman Kim Jong Un for keeping your word & starting the process of sending home the remains of our great and beloved missing fallen! I am not at all surprised that you took this kind action. Also, thank you for your nice letter - l look forward to seeing you soon!” Trump tweeted. On Wednesday night, the remains of what are believed to be 55 US soldiers killed in the Korean War arrived in Hawaii after being sent from North Korea, where they were met by US Vice President Mike Pence. "Some have called the Korean War the 'forgotten war,' but today, we prove these heroes were never forgotten. Today, our boys are coming home," Pence told the assembled crowd. "Our nation has worked tirelessly to keep our sacred promise to leave no man behind. And while several hundred of the missing fallen have been returned, for more than a decade, as a result of North Korea's nuclear threats and escalations, search-and-recovery efforts have been suspended - until today." Once the remains are identified, they are to be transferred to closest kin for burial. The repatriation of the remains comes as part of the deal made by President Trump and the North Korean leader during their summit in Singapore in June. Some 7,700 US servicemen are still unaccounted for from the 1950-53 Korean War, with some 5,300 remains believed to be in North Korea.